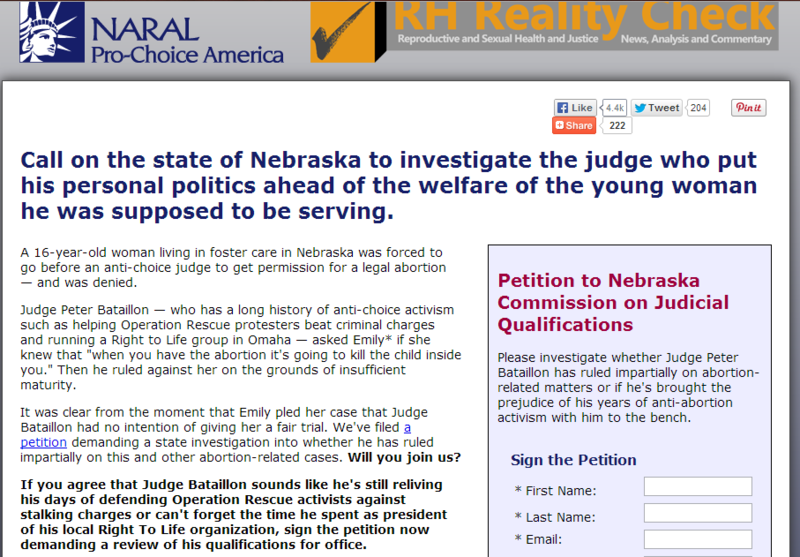 NARAL petition seeks to investigate judge for being pro-life. Unfortunately for NARAL, there is no way for Nebraska to investigate the judicial decisions made by a judge due to a little thing called “Judicial Immunity”. Basically, this means that a judge cannot be held liable in civil or criminal court for a ruling made from the bench. In the case Bradley v. Fisher in 1872, the Supreme Court ruled that “A judicial officer, in exercising the authority vested in him, should be free to act upon his own convictions, w/o apprehension of personal consequences to himself. “ This is precisely what Judge Bataillon did, and he cannot and should not be punished for doing his job.